Locals and firefighters gather around buildings that caught fire late Wednesday in Dhaka, Bangladesh, Thursday, Feb. 21, 2019. A devastating fire raced through at least five buildings in an old part of Bangladesh's capital and killed scores of people. A fire in Bangladesh that killed at least 67 people in the oldest part of the capital shows the lapses in public safety that still plague the South Asian country despite its rapid economic growth. While the government of Prime Minister Sheikh Hasina touts the garment factories and gleaming office towers in Dhaka's north side as signs of progress, illegal shops and overcrowding in Chawkbazar, one of the city's many warren-like southern districts, impeded firefighters' ability to put out Wednesday night's blaze, illustrating the country's uneven development. The government has zoning laws and regulations on the books, but has met public resistance when it tried to enforce them, Bangladesh planning experts said Thursday. A devastating fire raced through buildings in an old part of Bangladesh's capital, Dhaka, and killed at least 81 people, officials and witnesses said Thursday. After a warehouse storing flammable material caught fire in 2010 in Nimtoli, a district near Chawkbazar, killing at least 123 people, authorities promised to bring the area into compliance with building codes, and evict chemical warehouses from buildings where people lived. Industrial facilities can't legally exist in areas that are zoned residential, said Mohammed Manjur Morshed, an assistant professor of urban planning at Khulna University of Engineering and Technology. "This type of thing happens, there's a big initiative to move everything out, and then after some time people forget about it and the government is really not interested any more. It's like that," Morshed said. "Corruption buys building permits, and then there's very little oversight to see whether anyone is building according to the submitted plan," he said. In 2014, three people were killed and three others severely burned when a perfume warehouse on the third floor of a building in Chawkbazar caught fire. The following year, a fire gutted eight plastic factories. Morshed said government regulations are sufficient, but are routinely flouted in Chawkbazar. The contrast between new and old Dhaka - the city's north and south sides - is stark, said Shafiq-Ur Rahman, an urban planning professor at Jahangirnagar University in Dhaka. "As the area was developed continuously, there is very high population density and haphazard growth," he said. "You need to consider preservation to maintain the heritage, but this is not the first time. We have an unfortunate history, and we need in redevelopment to figure how to provide services, like access for firefighters." Denizens of the Muslim-majority nation throng to Chawkbazar each year for Mughal foods to celebrate iftar, when Muslims break their fast during Ramadan. In the festive atmosphere, makeshift stalls and itinerant vendors sell spices, sweets, minced mutton, kebabs and other delicacies in tight passageways teeming with the faithful. Thousands of animals are slaughtered in the open during Eid-ul-Azha, a sacrificial festival, near Chawkbazar Shahi Mosque. A government eviction drive in 400-year-old Chawkbazar and other areas of dld Dhaka to clear makeshift stalls from walkways was met with protests last May on the eve of Ramadan by business owners and residents. According to local reports, some 500 illegal stands were evicted from the narrow streets. In response, hundreds of legal shops closed in protest. It was not clear whether the death toll from Wednesday's blaze would affect the status quo in Dhaka. 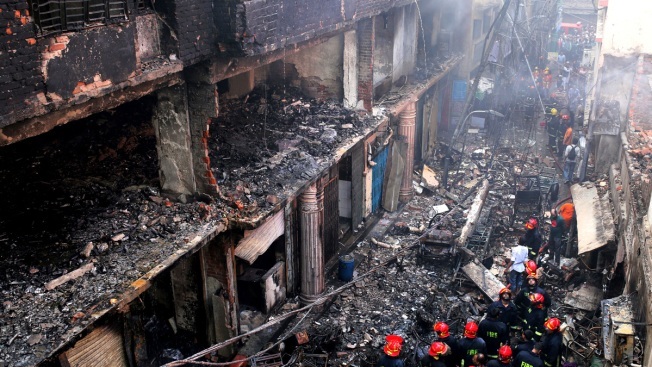 Fire officials had initially reported that 81 people died, but later lowered the number to 67. Russel Shikder, a fire department duty officer, said first responders had counted each body bag taken to the morgue as one victim, but that some bags contained only body parts, prompting a recount. On Thursday afternoon, shops had opened and the streets were crowded in much of Chawkbazar, except for within a police cordon where authorities continued to comb through the destruction left by the blaze. The fire was about 500 meters (550 feet) away from Dhaka's 18th-century Central Jail, a former Mughal fort where ex-Prime Minister and opposition leader Khaleda Zia has been held since February last year on corruption charges. Since 2016, the jail has only been used to hold opposition figures, and Zia is currently the only inmate. It was not threatened by the fire.